Ni Tsan is perhaps the most well-known of the Yuan dynasty (1271-1368) painters often referred to as the “Four Great Landscape Masters.” Ni, Huang Gongwang (1269-1354), Wu Zhen (1280-1354), and Wang Meng (1308-1385), are all recognized for their personal expressions of nature. They also experimented with novel brush techniques. Ni is particularly credited with popularizing a slanting brush stroke with very dry in which provided texture and a reduction in the calligraphic quality common in Chinese painting. He was born into a wealthy family in 1301 in the Jiangnan region. He was educated in the Confucian tradition in hopes of securing an official position in the government. Poetry, calligraphy and painting were indulgences. Brought up by his eldest half-brother Ni Shaokui (1279-1328) after their death of their father, Ni was exposed to a number of Confucian scholars and artists like Zha Mengfu (1254-1322) and Guo Bi or Guo Tianxi (1280-1335). 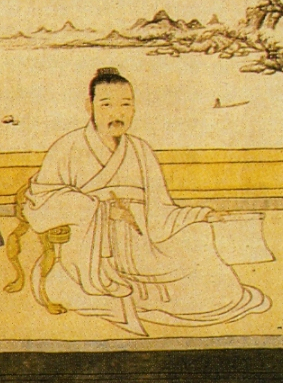 Guo Bi introduced Ni to the work of Mi Fu (1052-1107). Cao Zhibai (1271-1355) was also from one of the wealthiest families in Jiangnan. 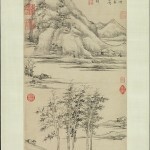 An artist himself, Cao had a large collection of calligraphy and paintings. He held gatherings in his formal gardens where scholars and artists would share their poetry, music and discussions with young Ni. Upon the death of Shaokui in 1328, Ni Tsan assumed the responsibility of managing the family fortune. Despite having built a famous garden, Ni was not a popular host due to his obsession for cleanliness. He was, however, a welcome guest at literary gatherings among Daoist scholars. Quite often earlier works of art were discussed and critiqued. While it is unclear if Ni received any formal training or tutelage in painting, he was most likely influenced by the conversations and the artists being discussed. Masters such as Mi Fu, Don Yuan, Juran (10th century), and Su Shi (1036-1101) are believed to have been among the artists studied. Ni's earliest known work dates to 1321 and is entitled Landscape at Sunset. The painting itself is gone but the accompanying poem by Ni survived. His earliest known surviving work is Enjoying the Wilderness in an Autumn Grove which is dated 1339. Around 1329, Ni met and became friends with Huang Gongwang, one of the other Four Masters of the Yuan Dynasty. They would often write the poems for each other's works. Ni, on his painting The Six Gentlemen refers to Huang as “old master.” Political turmoil and heavy taxation became a great burden for Ni Tsan. Some accounts mention the selling off of his family properties in the 1330s to pay taxes, some state he gave the assets away to friends to avoid them being confiscated and another theory is that he eschewed his worldly goods to pursue a more pure existence and gave them away to friends. He would continue to live a nomadic lifestyle, pursuing artistic and literary companionship and inspiration. Ni would become friends with Wang Meng and the two artists collaborated on at least one work – Songshi shanshu tu Landscape. During a visit to his hometown, he fell ill while staying with a relative. Ni Tsan died in Wuxi in 1374. 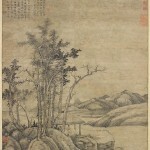 Ni Tsan is considered one of China's most important landscape artists. He painted during the Yuan and early Ming periods. You'll not find any people in his pieces and his work is devoid of color. 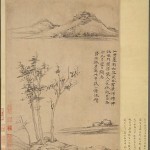 His works often consist of bamboo and somewhat barren landscapes. Yet, through open spaces, often in the middle of the canvas, he creates tranquil paintings that are greatly admired and often duplicated. In researching this article, I found more references to articles and paintings done “in the style of Ni Tsan” than I found actual information about the artist who would inspire generations of painters to come. The majority of the true biographical information I found came from one scholar's Master of Arts thesis on Ni Zan and his associates. It would seem much of the information from that work and elsewhere is attributed to the poems and writings of Ni Zan which appeared on his own paintings and the paintings of other artists at the time. His propensity for surrounding himself with learned men of the era would indicate that his writings and paintings were influenced by numerous other well-known scholars and artists, just as he most likely influenced their endeavors. Pseudonyms and alternate spellings of his name include: Ni Zan, Yuan Zhen, Yun Lin Zi, Huan Xia Sheng and Jing Man Min.